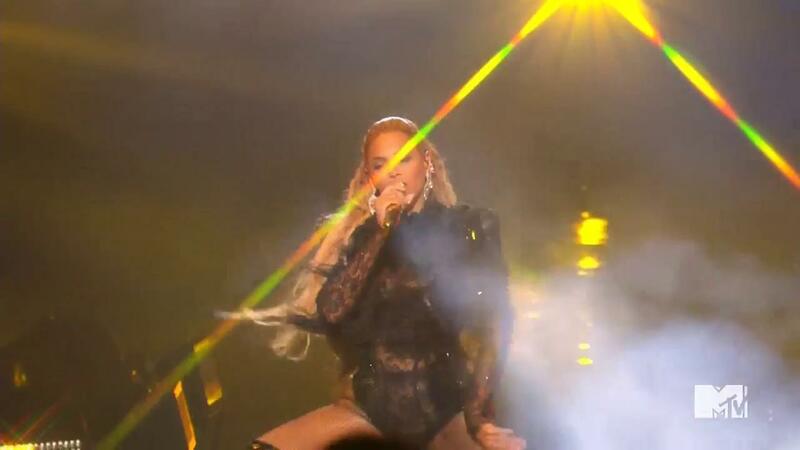 Beyonce just owned the night at the MTV VMAs. The singer, who is the most nominated artist of the evening on Sunday at the 2016 MTV VMAs, took the stage for what fans figured would be one song -- and then she didn't leave the stage for nearly 15 minutes. Queen Bey treated the audience to a full concert of her hits from her visual album "Lemonade" and it was absolutely incredible from start to finish. She kicked things off with her song, "Pray You Catch Me." As she performed, women around her were gunned down in a sea of red lights. It was a heartbreaking yet poignant way to begin the evening. Next, the 34-year-old singer kicked things up a notch with "They Don't Love You Like I Do," and she danced her way across the stage riling everyone up as she moved to "Hold Up" and started swinging her signature bat. And that's when things got fun as she put a dent in the camera filming her with her bat. Then she danced her way right into "Sorry" and "Don't Hurt Yourself." The mogul left everything on the stage as she made her way across the stage with nearly 20 dancers beside her in a sea of flames. She closed out the performance with "Formation" -- and when it was all said and done -- Beyonce dropped the mic. Literally. She said she came there to slay and she most certainly did.